from Friday, August17th of the year2007. So I’ve made it back home to New York, after a pretty surreal day of playing car-swap. Today’s itinerary included the following locations: Chinatown (home-base), the Upper East Side (! ), the Upper West Side (former digs), Providence, RI, (where the getaway car to Vermont is stowed), East Providence, RI, (where the rented car had to be returned), Barrington RI (where Liz’s parents live at), New Haven, CT (where Danny, Jojo, and IKEA live at), Throgs Neck, the Bronx, New York, (where I stupidly got off the highway to avoid traffic only to find more traffic – if you click the link be sure to note the Alternate Spelling), and then finally back home to Chinatown where I am drinking Vinho Verde (courtesy of Liz’s dad’s grateful Portuguese clients) and eating a small feast from the Malaysian restaurant in the paved arcade between Jing Fong Dim Sum and the Duane Reade on the Bowery. You know the one I’m talking about. So circular a journey, as well as Jenny’s pointing-out, reminds me: everybody needs to straight-up buy Helen DeWitt’s The Last Samurai at this time. It’s very rare to find a book where not only the language but also the setting and the plot can all simultaneously and separately force me to make audible noises of pleasure. I read this book on Jenny’s recommendation a few years ago on the subway every day, and there is a subway-reading sequence in the novel that is heartbreaking, funny, quirky ““ very cool. Helen DeWitt also has herself a blog ““Â check out her entry on Cormac McCarthy and Punctuation. This is also one of these books where to read it is to have the totality of the author’s vision only hinted at: despite its epic scale, it still feels like a tiny but perfect puppet fable played at the outskirts of a big, bustling city inside her head. I don’t say this by means of a judgement, but rather, it is interesting and important to think about the scale of the work that you’re doing and how it relates, in a sense, to the greater Projects that you have going on. I know that one of my major problems as a composer is that I used to feel, instinctively, that each piece had to fully represent (even in fleeting miniatures) all the aspects of my Whole Thing. Part of this is lack of self-control that I know will come with maturity but another part of this is, I think, insecurity about mounting that tiny puppet show when there’s a big city to explore ““ wouldn’t everybody rather just get in a really fast car and have a whole tour of the whole city and I’ll just talk really fast and tell you everything I know about every building we pass!?!?!?! Obviously, not so much; this sort of mania is pleasurable for about five minutes, and then it gets boring. My big goal for the last year and for the upcoming year is to really get this under control: the ability to let go of feeling the need to play audio tourguide in my own music, and allowing each piece to live in its own autonomous township within the whole country, as it were. Obviously, this metaphor has a limit. I had a really interesting conversation with a Friendly Faroese about whether or not each individual township should have equal votes in the country’s colonial parliament (Faroe being technically a “county” of Denmark). Evidently, small and remote towns are able, through complicated voting procedures, to allocate enormous amounts of funds to have bridges and tunnels built to their otherwise sea-access only town-centers. “How many books,” my friend asked, “could be translated with that money! ?” The obvious downside of reforming that practice, of course, is that the power could become centralized to Tórshvan (at left) and, by extension, Denmark. I found it completely fascinating to talk to people in their 20’s and 30’s paraphrasing Partha Chatterjee (“traditional nationalism is a shadow of the raj” ““ “middle class people under Danish government don’t want it to change no matter what they say” ““ this sort of stuff) and then rushing off to play a punk-rock show on the beach seconds later. Teitur, whom I’ve enthusiastically blogged about here before, has a bunch of songs on his Faroese album about issues like this ““ the changing ways of the Island, bridges and tunnels, etc. For me, the most successful one is the least political. It’s called Havnin er ein lÃ­tll bygd ““ I was halfway through a really lousy translation of some of the lyrics (for me the procedure is to look up the Faroese words in my Icelandic diction’ry, because they are usually pretty close, although because of the Faroese Accent and the Icelandic one being almost completely upside-down from each other, I can’t always figure out what’s going on, plus also, some of the roots are basically Danish and don’t turn up in the Icetionary, also, you can’t really ask Icelandic people because to them, Faroese sounds like some combination of R2D2, Nell, and Michelle Tanner so if you start asking what stuff means they usually stifle laughter or make the “aww” noise) when I discovered this website with excellent translations by people who know what they’re doing, so you can listen and follow along. It was a pretty incredible moment to stand there among about three thousand Faroese teens all singing along with the lyrics at the end of the song: “Havnin er ein lÃ­til bygd / her er so trongligt, men eisini so trygt” ““ “Tórshavn is a little town / it’s so confining there, but also so secure” ““Â good song. And “-trygg-” and its derivatives is one of the first norse roots I was able to trace around into people’s names, the insurance company, instructions for tying knots in Faroese, etc. Your puppetry problematic is related to one reason I decided not to move to New York years ago. In a community with as many composers as that city has, there’s immense pressure to esstablish some name-brand identity, to sharply define the territory in which you work as well as the borders to the territories in which you do not work and others do. While these sharp divisions have led, in many cases, to beautifully concentrated work, I never could figure out how my own working methods, without an easily identifiable aural footprint, could function in such an economy. 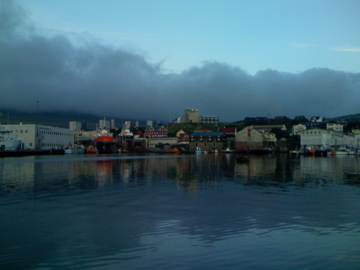 The song is about TÃ³rshavn. But the lyrics use the name Havnin. Is this a nickname? A diminutive form? Dialect? Slang? Nico responds: I am anything but an expert on these matters. But the way that works is that havn is the word for harbor, and the -in ending is a definite article; like in Icelandic, definite articles are stuck on at the end. This usage mirrors how I speak about New York, viz., “I got home to the City last night,” implying that while there are many cities, there is but one City.